During Naked Capitalism’s comment holiday, Yves and I visited the Maine Narrow Gauge Railroad Co. & Museum in Portland, before the meetup. Unfortunately, we arrived to late to take the “leisurely train ride” along the Eastern Promenade of Casco Bay, which I’m sure would have been very pleasant. 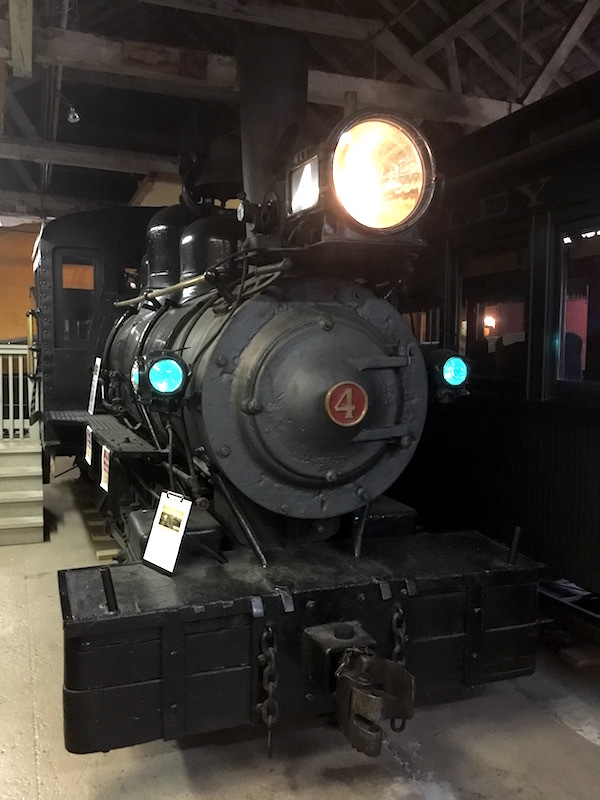 (There are also operating two-footers at the Wiscasset, Waterville & Farmington Railway Museum up in Alna, at the Sandy River and Rangeley Lakes Railroad in Phillips, and at a “railway village” in Boothbay.) 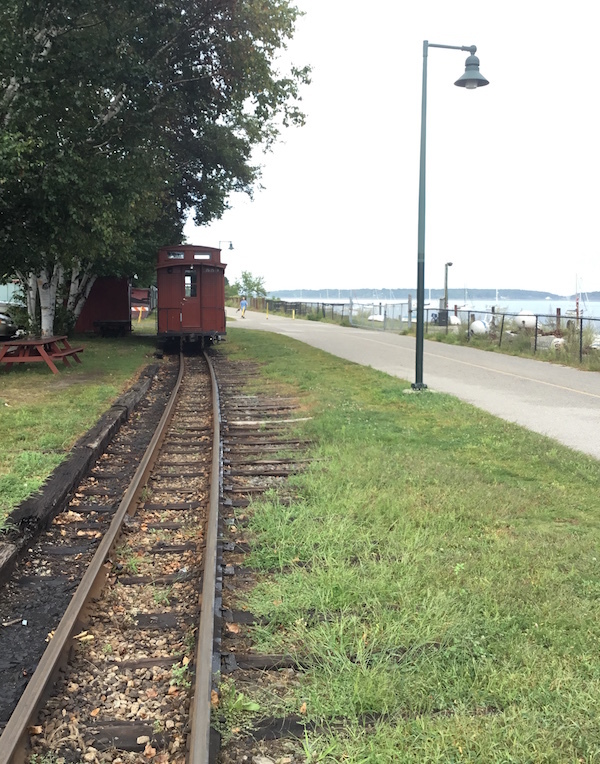 This post is a trip report from that visit, with some comments on the history and economics of Maine’s unique narrow-gauge system, followed by a fanciful policy proposal. A caboose, showing the width of the two-foot gauge. That’s really narrow! The idea of a two foot railroad developed after George Mansfield of Massachusetts visited Wales in the 1870’s and saw the Ffestiniog Railroad (which was actually only 23 1/2 inches wide)… the world’s first narrow-gauge public railway. In 1875 Mansfield established the Billerica & Bedford Railroad in Massachusetts, the first commercial two-footer in America….. When the Billerica & Bedford failed, the railroad equipment and Mansfield made the trip to Maine, where he organized the Sandy River & Rangeley Lakes (SR&RL) railroad in 1879. At their peak, the Maine Two-Footers operated on over 200 miles of track transporting both passengers and freight in and out of rural Maine. They played a key role in the timber industry as well as early tourism efforts. These companies were the smallest narrow gauge common carrier railroads in the United States. Track gauge is measured between the inner faces of the load-bearing rails. Gauge matters because all of the equipment running within a network needs to have running gear to match the gauge. The U.S. standard railroad gauge is 4 ft. 8.5 in. Maine had a unique system of narrow gauge railroads on track just 24 inches apart developed to lower the cost of railroad construction and operation, allowing them to be built in areas where it would not otherwise be economically feasible. 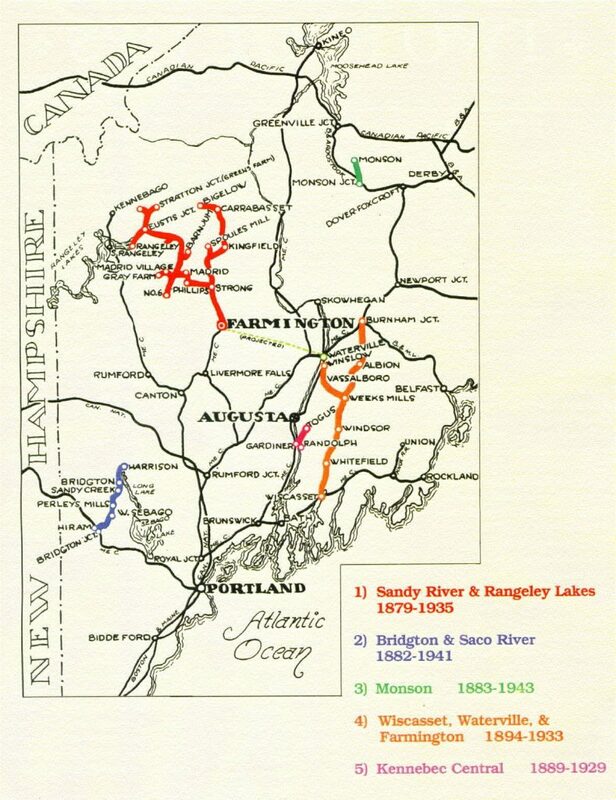 The [Sandy River and Rangeley Lakes Railroad (SR&RL)] was the largest and most financially sound of the Maine two-footers. Its prime focus was moving lumber from the timber-getting areas to the various mills on the road, and moving timber products to a connection with the Maine Central at Farmington. The mills were either plywood mills or turning mills producing things like axe handles, broom handles, and toothpicks. At one time Strong was the (self-proclaimed) toothpick capital of the world. The mills required logs in 6 to 8 foot lengths, so the SR&RL had none of the log bunks usually associated with logging operations. The SR&RL was also home to a series of baggage/combine/cabooses and to a number of rail busses in later years. [The Wiscasset, Waterville, & Farmington (WW&F)] was basically a granger road, bringing farm products (mostly milk and potatoes) to the dairies in Wiscasset, and transporting farm supplies and mail back. Because its key commodity was so perishable, the WW&F ran a very tight ship in regard to the speed and scheduling of milk and express (usually combined) trains. The last line closed in 1943. Most of the lines became the victims of competition with trucks. (Maintenance was also an issue for these low-margin operations, which is an argument for “publicization.”) Or, rather, to the fossil fuel-dependent transportation system that included trucks. I think intermittently, though perhaps more than most, of what William Gibson has called “The Jackpot“; for which read collapse. It seems evident, even today, that fossil fuel (gas) vehicles running over fossil fuel (tar) roads really aren’t long for this world; even today, localities are reverting to gravel (if “reverting” is the word I want). And electric vehicles, their supposed replacements, depend on an extremely complex and fragile supply chain that may not be long for this world, either. 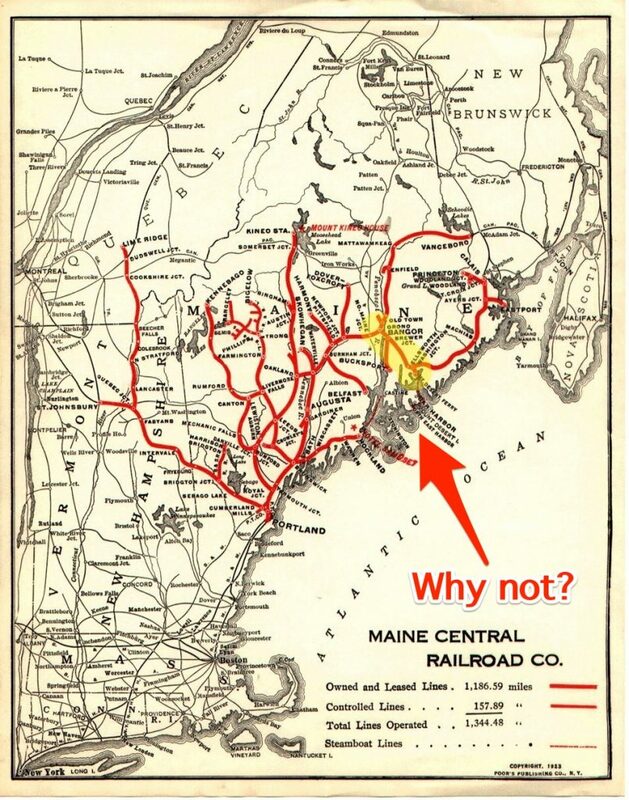 But was the Maine transportation system of 1923 — a thick network of railway lines, with smaller vehicles connecting the stations to local destinations as feeders — so very bad, really? Bringing me to my policy proposal: I think the great state of Maine should revive the two-footers with a view toward making them our primary transport medium after the Jackpot. I don’t think that’s how one would sell the project, but that would be the ultimate goal. The arrow labeled “Why not?” points to first route I suggest, which is highlighted: From Bangor to Bar Harbor. You will note that there’s already roadbed on that route, from trackage abandoned by Maine Central. The business case for the (state-owned) Bangor & Bar Harbor Railway would be — as for so much else in Maine — tourism, from the cruise ships at Bar Harbor; a day trip through the Maine country-side to whatever destinations would spring up in Bangor would be quite pleasant. The business case would also include ordinary passenger transport. The lower construction and operation costs of the two-footers apply just as much today as they did a century ago. 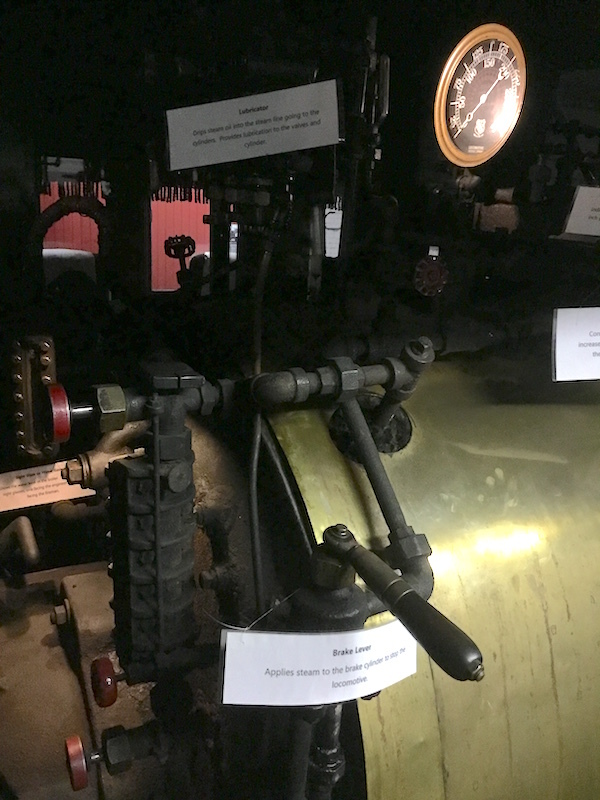 The locomotives, besides being cute, would be — naturally — steam, and fired by wood, which Maine has in plenty. (Building the locomotives and the rolling stock would also be a new light industry for Maine.) There would be, no doubt, howls of protest at the use of tax money; but the (fossil fuel-based) road system has enormous public subsidies, and we have to either cut those back, or have the Jackpot cut them back for us. Why not get out in front of the problem? Of course, I welcome commentary from actual transportation experts, being myself but a humble railfan! I’m eliding “horse-drawn” because it’s possible that somebody who’s thought through these transportation issues more deeply than I have may have a different solution. Several of the museums run “ice cream trains.” How about a “lobster train”? Or a blueberry train in the morning, and a lobster train on the return trip? Yes, that would require a dining car. And? This entry was posted in Global warming, Guest Post, Infrastructure on September 16, 2018 by Lambert Strether. I am trying to imagine Virgil Bliss running on a smaller platform. 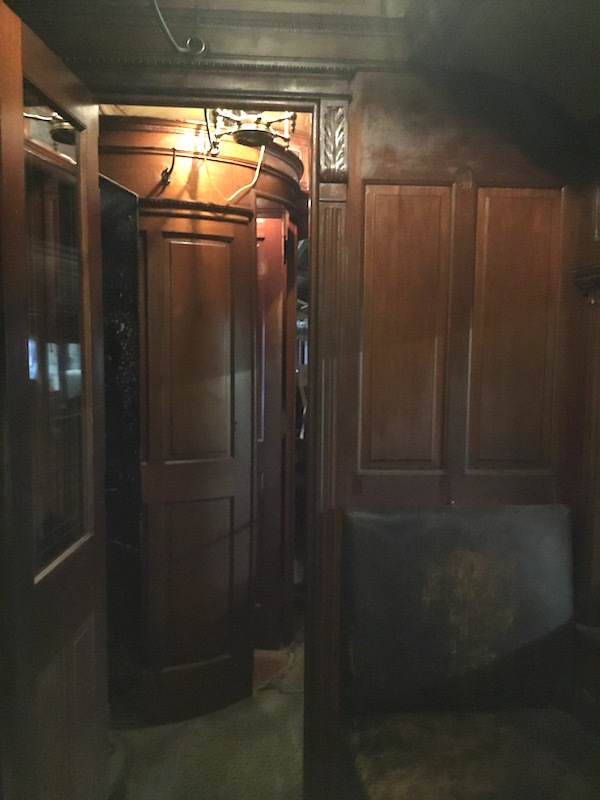 The woodwork in the passenger vestibule is definitely exquisite; and expensive to recreate on a large scale. However, the San Francisco cable cars are made of wood, too. The City has a complete workshop of woodsmiths who maintain and restore cable cars to similarly exquisite craftsmanship. As for recreating regional (local) rail lines the Two Footers would be limited in speed. The narrow gauge limits speed at curves (and the number of people abreast a car can carry). As tourists attractions they would likely generate interest; the Ghost Train in remote Ely, Nevada does just that. After the Jackpot, that’s going to be a good thing. Newfoundland ran ‘narrow-gauge’ 3’6″ railroad from 1882 to 1997, with passenger service from 1898 to 1969. It ran a total of close to 1000 kilometres, including branch lines. Built that way for reasons of economy, it became a problem with shipping once Newfoundland joined Canada in 1948. At Port aux Basques, the port for traffic from the rest of the country, the government built a standard line to offload regular trains, then a conversion factory to make rail cars convertible from on gauge to the other. Outside Port aux Basques is an area through which the trains ran called The Wreckhouse. In stormy weather empty railcars would frequently be blown over sideways in winds topping 125 kph. Trains had to be held on each side sometimes to let winds subside. The same is true of transport trucks, which travel the road through the same region now. So many old things becoming new again! Now if I could just get my heirloom tomatoes to thrive in this weather! Mention of narrow gauge railways always remind me of Percy French’s song ‘Are you right there Michael?’, inspired by being stranded by the notoriously unreliable Clare narrow gauge line. There is still a network of working narrow gauge lines in Ireland, all used for the harvesting of peat. I tried to cycle one defunct line recently, but the line had been taken up due to repeated thefts from gypsies (so I’d been told), and the route was too overgrown even for my big wheeled mountain bike. In Ireland, as in much of the world, narrow gauges were used to link tourist areas to main stations. One amazing one, the Dalkey Atmospheric Railway, used air pressure (150 years before Elon Musk!). The line is still there, its known as the Metals. Speaking of Musk, if narrow gauge lines were ever to be opened, I’ve often thought that this would be an ideal application for self driving car technology. Just maybe self driving railways on rails could be economically viable in rural areas where there is an existing line, especially if something like flywheel electric storage was used for power. Linked to this of course, is the new popularity of electric bikes. I was recently on a narrow gauge line (a section of the line is still running as a tourist attraction) now converted to a cycling Greenway in Waterford in the south of Ireland. Its been astonishingly successful, it was packed the last time I was on it. Many older people were using electric bikes to travel. In the Netherlands, electric bikes have proven very successful with older people. Perhaps the mix of electric bikes and scooters with small trains on those lines could be a potential alternative to buses for many people, and a big attraction for leisure travellers. The Irish government just announced a 50 million euro investment in cycling routes along old railways and canals, mostly the former narrow gauge lines. Its proven a very good investment wherever its been done. It proves very much that fear of traffic is the primary reason people don’t like to cycle – give them a traffic free alternative and the results are usually bike traffic jams. There is no need to bring those old lines back to old uses – there are plenty of great things that can be done with a bit of imagination. PK, you are quite right about the ascendancy of the electric bike and the fear of traffic by many cyclists. I’ve been involved with bicycle planning in some fashion (former putative municipal bike czar) in the US since the 80’s. Electric bikes are changeing everything. My coastal tourist city is seeing a growing number of seniors on the coastal bike path. In time, they gain confidence and enter the on-street bike lanes. (I’m not certain they’re clear on the dangers of inattentive (cell phone) drivers.) Having the right-of-way in a collision on a bicyle is usually simply the ‘right’ to take an ambulance to the hospital. The US has had a program to convert old rail lines to bike paths called Rails to Trails since the ‘late 70’s. The funding initially came from federal transportation funds, but over time federal recreation funding was also added. The Irish government has been slow in adding these types of bike trail conversions. England and the Europe mainland has numerous completed projects. Lambert–could you or others elaborate on the above statement? Are you referring to the minerals used to make the batteries, the power grids to supply the electricity (i.e. coal, nuclear, renewable, etc.) or something else? Electric cars need power electronics. Made from switching elements, capacitors and magnetic components. Magnetic materials for power electronics depend on materials called ferrites, ceramic magnetic components mades mixtures of various magnetic materials like Iron, often also using rare-earths, which we get by crushing some mountain in China and “filtering” it. The “rare earths” are rare because the concentrations are low, lots of ore must be processed to yield useful amounts of material. The main switching elements in power electronics are Mosfets (Latest & Greatest based on Sillicon Carbide, not Sillicon), Insulated Gate Bipolar Transistors (IGBT’s) and Thyristors / GTO’s (Gate Turnoff Thyristors). To properly control the charges inside these devices, which increases the speed and controls losses, they must be “doped” – some atoms of the bulk material is replaced by different ones, creating “defects”. The favourite process for doing this is neutron irradiation. Capacitors store energy for short-term use, for example to absorb voltage spikes caused by the fast switching of the IGBT’s / Mosfets. The best capacitors are made with Tantalum (Electrolytic) and Polypropylene (non-polarised) devices. The Electrolytic capacitors are used for larger capacitance values and lower currents, the Polypropylene devices are used for high currents and lower capacitance values. Tantalum is found in Congo, there are several wars going on there. The Polypropylene devices are made with aluminium foil and plastic film insulation (polypropylene). Electrolytic capacitors rivalling the Tantalum devices can be had from a few specialist suppliers such as Nichicon Corporation in Japan. Moisture will kill semiconductors so they are encapsulated. The encapsulation has two parts, a “conformant” (bendy) coating covering the chip and a hard encapsulation keeping everything mechanically secured. The conformant coating is only made in one factory in Japan; back in the naughties this factory burned, people substituted another epoxy and we had harddrives dying 2 years later because the other epoxy was different and the process was not set up for it. So, we need for electrical cars: Chemical Factories, Components that are sourced fro earth-quake zones, Nuclear reactors (or Accelerators), The capacity to crush mountains worth of rock and extracting the base materials, Ore Refineries, Engineers and Technicians (lots and lots of those) and good Universities to develop new technologies and to train the aforementioned people. The modern world is very brittle. Sure, we can regress on some of the technologies and survive in a fashion (after all, the Germans could do decent missile guidance using power electronics based entirely on vacuum tubes and magnetic devices called transductors in 1942, but, we cannot build an electrical that matches our needs for range, safety, reliability and costs with a “steam-punk” level of technology. I would hope that someone is noodling out how to do decent LEDs with steampunk levels of resources and mass production. That would be one more thing to keep up a cycle of usefulness for electrical knowledge. And let me plug my favorite steampunk electric car, the Detroit Electric. Not very viable while there are Tahoes about. I’ve been thinking that I would like my next washing machine to be a pedal powered unit in the back yard under a little sunshade. It looks like I will have to design it myself from the Maytag up, I can’t even find anything on the Asian sites. All the “off grid” washing machines I’ve seen are plastic, dinky, and hand cranked. Reverting sounds tame. Even devolving, or regressing. What about collapsing? My whole life I’ve been fascinated by handcars. In recent years I’ve daydreamed about a lightweight — maybe even inflatable — car that one or two people could easily carry and put on and take off the tracks as necessary or as desired. There are dedicated handcar enthusiasts who meticulously restore and sell vintage cars, and a California company offers kits to build new ones, but their finished car weights 500lbs. It seems to me that at prudent speeds and under good conditions, weight needn’t be a factor in keeping the car safely on the tracks. Given the wealth of arcane knowledge here at NC, might someone be able to suggest whether my idea is feasible? Well, with carbon-fibre construction you might drop the weight a couple hundred pounds, but increase the price 10-fold. It’s also good to remember that rail lines are one-way (at a time) and that the steel wheels that contact the rails were intended to reduce friction (and carry heavy weight–freight and the locomotive). There are people who make quadricycles or railway bikes that operate off a principle of low weight and high ease. (check out this great old internet site http://rrbike.freeservers.com/ ) If you’re interested in smooth personally powered rail travel that’s not operated by the hand. Lambert’s post intrigued me, and apparently one of the big advantages of narrow gauge rail is that it’s much easier to dismantle and build again somewhere else, this being key for moving timber, as there would be no timber to harvest for a long while after the cutting was done. Imagine that, reusable and redeployable infrastructure. I bet a lot of cities would love to be able to roll up their suburban sprawl tarmac and put it somewhere else. car that one or two people could easily carry and put on and take off the tracks as necessary or as desired. Since its low speed and 1-2 persons, like a bicycle it is not the end of the world if it crashes … Could one not make such a vehicle from something simple, like 5-mm plywood “structures” or even pine strips with fibreglass reinforcement? Something that folds flat on a car roof? People build aircraft and kayaks from plywood, fibreglass and pine strips all the time. Since forever there have been simple outriggers that clamp onto a bicycle frame so that you have both wheels on one rail and a roller propping you against the other rail. The issue with lightness of a handcar would be getting traction against the steel without increasing drag. Freewheels with rubber tire should do that. I can understand the romance. As a child who grew up watching TV I had assumed that handcars and quicksand were something you regularly dealt with as an adult. 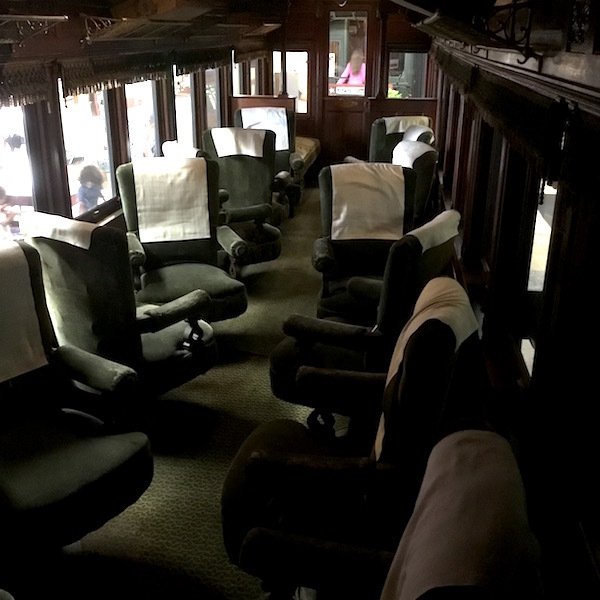 I’ve traveled on two narrow gauge rr’s in India…to Darjeeling and to Shimla. It is amazing how fast they were built in the late 19th Century. The extreme rise in elevation in a short distance is another remarkable festure. The Chinese are proposing to build a rr line from Lhasa to Kathmandu over the main Himalaya ridgeline. Neoliberal Walking Dead America is well past the ability to do such things…reasonable material benefit for the most people in a situation such as a rational transportation system. The Illinois Railway Museum in Union, northwest of Chicago and maybe ten miles south of the Wisconsin line. Another museum run by volunteers. Some of the trains in the enormous car barns look as if they could have been designed last week. The amount of work that went into trains is astounding. Now to get them back….poor Amtrak is a ghostly shadow of the U.S. train system. I am so old I can remember the parked narrow gauge steam engines and flat cars at the Weyerhaeuser Enumclaw Mill that had been replaced by diesel trucks. This is all gone except for the clear cuts. As long as chaos is avoided and there are librarians, a soft collapse to renewable solar energy is possible. The technology is available. The resources and will, maybe not. Borders and militias need to be reestablished. The restoration of the rule of law along with family farms are required. Long distance travel will severely curtailed and combined with transport of goods. The current political polarization and conflict between the haves and have nots, due to overpopulation, is the real problem. I think that we are seeing the future of light transport here as recoverable oil runs down. It doesn’t seem to be a bad way to travel and when I look at those trains, I am reminded of tramways we use to have. They certainly bear a resemblance on the outside. That two-foot guage seems to be fairly common in the United States (https://en.wikipedia.org/wiki/2_ft_gauge_railroads_in_the_United_States) as they are listed in quite a few places. I wonder if that it is because one man might be able to carry one sleeper by himself in constructing a railway track? If you got to https://www.youtube.com/results?search_query=Maine+Two+Foot you will see that there are quite a few video clips on Main’s railways, several of which are from much earlier times. Looking at the first one I can see lots of snow so I guess that that means it gets cold in Maine in the winter time. That first one called “Maine Two Foot Railroads” seems to be very informative. Having been a railway shunter once in an earlier life, I do not think that I would like to play around with those trucks though. Certainly not in winter time. And no real surprises about an Australian source for info on those railways as we have a fair number of heritage railway lines (https://en.wikipedia.org/wiki/List_of_heritage_railways_in_Australia) still going in Oz as people seem to love riding them. I love traveling by train. When I moved to the west coast, I was disappointed to find out there wasn’t a train route that linked all of the major west coast cities. Rail transport in the US has become third world. The problem is privatized systems. Passenger service is way down the list and freight is like 20 mph “land barges”, centered around (1) containers bringing Chinese imports to consumers (2) bulk commodities such as coal, grain, oil and plastics and (3) here in upstate NY, trainloads of garbage from NY/NJ to dispose in landfills and incinerators. Contrast that with Russia where rail is designated by law to be the primary means of land transport. They also have a VERY highly developed passenger network. Check out the Rhaetian Railway in Canton Graubünden. It is as if all the narrow gauge has all been kept in place, electrified and operated with modern equipment. You can spend a week just there alone! Just look at their videos and webcams. Rhaetian Railway — nothing else like it in the world. Hourly passenger trains, freights, great, spotless equipment. And RhB is just one of the many cantonal-owned regional railways. The national system SBB connects all major cities. And the postal bus system goes where steel rails do not. Swiss Rail paper timetable was the size of a phone book; now their app replaced it is simple and intuitive to use. It has schedules for every train in the country (and there are thousands). Lambert, if you’ve never been the Switzerland, give it a try. 60 cms railways – which is pretty much the same thing as 2ft – played a huge part in World War One in getting troops and materiel to the front. You can read about them in my book, Engines of War published in the US by Public Affairs. An old friend of mine (model rail enthusiast, natch) has for the last 20 years been working at a youth camp (Doe River Gorge) in Tennessee. When they bought the land they inherited part of a three-footer rail system, and he has been instrumental in getting a section of it (plus associated hardware) working again: Doe River Gorge Railroad Similar history to the Maine two-footer network (driven out of business by trucks in the 1950’s). They still require a fair bit of infrastructural support, but not like automobiles. Narrow gauge would end up being very expensive due to having to customize everything and having very limited options for spare parts and maintenance. Rebuild them either heavy gauge lines and use diesel multiple units, basically a bus on rails, or bring back the interurbans, https://en.m.wikipedia.org/wiki/Atlantic_Shore_Line_Railway. One of the big problems of the US rail system is everything is done on a boutique basis, with no copying of international best practices. Send someone to the Netherlands or Switzerland and have them copy the rural rail system there. The last thing we need is to develop a new approach when there are so many good examples out there already. Photographer Ritayan Mukherjee documents his journey on the Gwalior Sheopur Kalan Passenger train, which runs on the longest remaining narrow gauge route in the world. Of course in India, 4′ 8.5″ would constitute narrow gauge if they had any. 5′ 6″ is tne norm. Interesting post. Yes, the woodwork is lovely – but we really can duplicate that with modern computerized routers. The issue with this paneled construction is mostly one of weight, and lack of fire-resistance, and they don’t hold up well to changes in humidity and heavy-duty cleaning etc. As far as “The Jackpot,” I wouldn’t worry about that. If/when it comes, the big deal will be lack of food. Things will be very messy, and the one thing that we can know for sure is, however many people survive, they will all have at least barely enough to eat. The equation will balance, we don’t need to worry about that or plan for it. It’s just that most of the survivors won’t enjoy it. For a preview we need only look at modern Bangladesh or Yemen etc. What railroaders call narrow-gauge (3 to 3’6”, 1000-1070mm) are the minimum scale for “real” railroading, and two-foot (610mm) gauge lines are an entirely separate, entirely uneconomic category. They only existed to carry freight from hilly or unstable terrain a short distance to a waterway or a main line railway yard. Other examples include lines built for sugar beet and sugar cane harvests (Cuba, Indonesia, Fiji, and elsewhere) and the peat traffic Plutonium Kun mentioned. They lasted until the first dirt roads were in place, or until a major storm washed away the (very cheaply built) line or the locomotive needed major repairs. They often depended on quasi-slave construction/maintenance labor, as with some of the sugar lines, or the timber line built by convicts at Ushuaia in Tierra del Fuego. Unlike true narrow gauge lines, they have absolutely no use in the modern world except (like Tierra del Fuego) for tourism. Railroad economics are hugely dependent on the efficiency advantage of larger gauge is massive (allowing much more capacity per train and much less energy required for a given load) and the ability to achieve maximum throughput on a given line. Unless your line can be built with slave labor, and there’s no possibility of a road alternative, the idea of a cheap, low-cost railroad is a non-starter, even in a post-collapse energy environment. Operates a 2/3 scale Shay side-geared steam locomotive during the 6 or so shows held each. A bit larger than 2 foot gauge, but you can see it operate, ride behind it, and get a sense that these things look pretty, but harnessed steam is scary powerful. Not train-related, but certainly a fine old retro-technology. A safety-razor-blade sharpener. How many shaves could one get from a blade with this machine? A hundred? A thousand? Conservation-lifestyling technology on display.